Heads up! - a HUGE thanks to Lorraine! Heads up! - a HUGE thanks to Lorraine!, originally uploaded by the-icing-on-the-cake. (Jo). So here are some of my examples of Aine2 style faces - I hope they inspire you to try them out for yourselves! (If you want to make faces like this you simply HAVE to buy Lorraine's tutorial on making heads! - it's called 'heads up tutorial' it's the best £5.25 I ever spent! ) ... I am slowly getting better at the mouths!, but absolutely love that I have got close to achieving better face modelling techniques! a real triumph for me this year! 1. 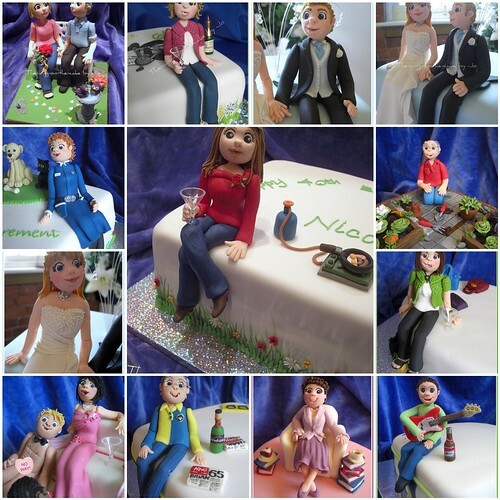 Nicola's cake topper, 2. Christine & Dennis Cake topper, 3. Jeanette's cake topper, 4. Groom topper ~ Lee, 5. Sarah & Lee ~ Topper close up, 6. Hilary's cake topper - Retiring District Nurse, 7. Clive's cake topper (another attempt at Aine2 style), 8. Bride topper ~ Sarah, 9. Julie's 50th Birthday cake topper, 10. Natalie's 18th cake! (censored! ), 11. Brian's cake topper, 12. Rose's cake topper close up, 13. James cake detail close up!